In the old days there was nothing and often solo Cross Stitchers wandered for months wondering if they were the only ones of deviantART that stitched. Then one day the founders met each other and from there it seemed Stitchers were popping up all over the place and they thought, wouldn't it be wonderful if there was a community? So, from that thought, Stitching Pirates was born and we look forward to providing you with the best community possible. Don't be afraid to ask questions, provide feedback! Without the people a community just wouldn't be what it is. The name Stitching Pirates grew from the key pirate concepts that X always marks the spot and maps lead to something wonderful. The same applies to Cross Stitch and plus pirates are just awesome. Yargh! Welcome to Stitching Pirates the Cross Stitching Juggernaut. What is Neglected Floss Stitch Along? It is a wonderful way for everyone to utilize that floss that has been hanging around your stash. For some, it probably bothers you just a tiny bit that you have these flosses that never get used or there is just a tiny bit left of some specialty floss that you may never use again from a kit. Here is the best way to ensure you use every one of your stashed flosses at least once, or finish them off entirely! Gifted floss, those bobbins that sit quietly in your floss boxes, bags, or drawer never getting used or are forgotten; this stitch along is a lovely way to get that floss used. The first year it was an anything goes thing when it came to color. The second year was an an optional key so that if you had an idea of where to go with the colors if you liked them. The third year was something very different for the NFSAL; not only was there a 12 biscornu/pincushion patterns BUT there was also an optional whole year frame in case you'd like to do a larger thing. 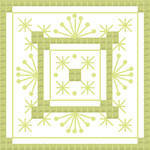 This year there will boast a new pattern every month and each month's pattern will be a different size and design. Ready your mind for anything! The patterns could be square, diamond, round, just about any shape you might imagine. The color keys are one color so it's up to you how many or how few different neglected flosses you use. NFSAL is now in it's 4th year running. To any UK stitchers, I just found an amazing website that seems DMC threads cheap for only £0.58 each! www.enchanted-needle.co.uk/ They also sell complete sets of all DMC threads for £213, stitch kits, fabric, the works! These are awesome! So much talent in each one, and the details are incredible! Many thanks for request, much appreciated!